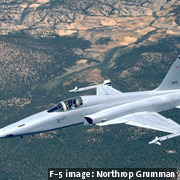 OLATHE, Kan. Garmin International, a unit of Garmin Ltd., has been selected by defense contractor Tactical Air Support, Inc. (TacAir) to install the Garmin tandem integrated flight deck for TacAir's fleet of supersonic F-5 fighter aircraft. Tactical Air is a private company in Reno, Nevada, that provides training and services -- including Joint Terminal Attack Controller training, unmanned aerial vehicle (UAV) chase, flight training, maintenance, logistics, and adversary support -- to the U.S. military and allied forces. The Garmin-TacAir agreement calls for TacAir to integrate the Garmin avionics decks -- consisting of of a G3000 flight display and dual Garmin touchscreen controllers -- in its F-5 training fleets in the later part of 2018. 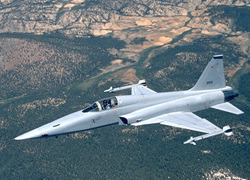 According to information from Garmin, the modular G3000 integrated flight deck's high-resolution flight display interfaces to the F-5’s existing mission computer, enabling advanced mapping, tactical radio capabilities, and clear radar display. Garmin also says that the G3000's open architecture enables integration of mission computer, sensors, and systems and will be easily upgradeable in the future. Garmin officials say that commercial off-the-shelf (COTS) Garmin hardware and software for the new avionics deck help reduce development time, speed integration of new technology, and reduce life cycle costs.